Drs. 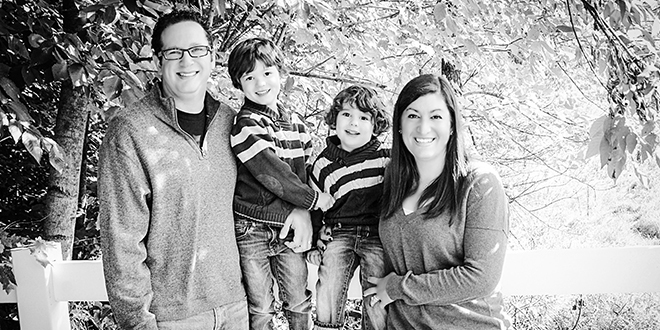 Mindy and Jason Streem of Solon love being a young family in Jewish Cleveland - from enjoying the outdoors in Cleveland Metroparks with their two boys to sitting down for quiet Shabbat dinners at home. They met each other through Alpha Omega, the historically Jewish Dental Association (Mindy is an orthodontist and Jason is a periodontist). One of the fraternity’s motto’s is tikkun olam (repairing the world); Mindy and Jason are continuing to pass on that message, thanks to PJ Library. Q - How do you integrate PJ Library in your home? We are a very busy family and our children are young, so PJ Library has enabled us to teach our boys about the holidays. At their age, it gets them excited about the upcoming learning in Sunday school and their Jewish life ahead. We read the great books and teach our kids about Jewish identity and traditions. Q - How has PJ Library helped your family incorporate Judaism? We've read about holidays and traditions in the stories, which has helped bridge to the children's understanding of each holiday and why Jewish people do the things we do. The books are written for children, so they incorporate the normal traditions with fun and exciting themes. We feel such a sense of togetherness in this city. Growing up in a very small town, with few Jewish people, we find it comforting that there is such a large community. Our favorite things about this city are the beautiful Cleveland Metroparks, Holden Arboretum, or the Botanical Gardens.